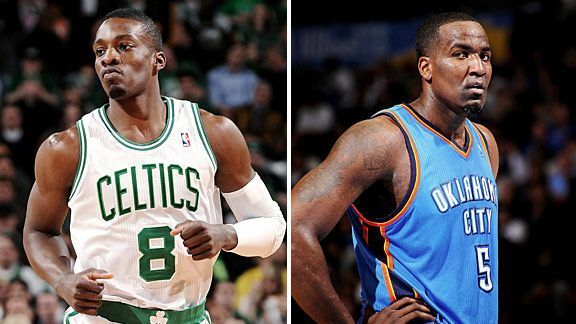 Did Danny Ainge try to get Kendrick Perkins back in Boston?ESPN's Chris Broussard dug up yet another interesting Celtics tidbit for us this evening, one that casts last season's Kendrick Perkins-for-Jeff Green trade in an entirely new light. After last season's playoffs, the Celtics offered Rajon Rondo and Green to Oklahoma City for Russell Westbrook and Perkins, sources told Broussard. The Celtics, looking for another scorer who can create his own offense, thought Westbrook might be available after his erratic postseason play. But Oklahoma was not interested in the deal. Green averaged 9.8 points and 3.3 rebounds in 23 1/2 minutes per game for the Celtics after coming over at the trade deadline. Perkins, who signed a new deal with OKC after the trade, averaged 5.1 points and 7.9 rebounds in just over 25 minutes per game for the Thunder. Westbrook averaged 21.9 points and 8.2 assists per game for the Thunder last season. Rondo averaged 10.6 points and 11.2 assists. Your turn: What do you think? Which tandem would you rather see in green, Rondo and Green or Perkins and Westbrook? Vote in our poll and sound off in the comments.